VICTORY! 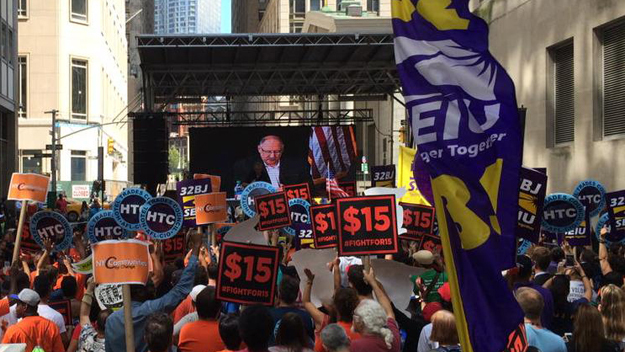 FAST FOOD WORKERS OF NY STATE WIN HISTORIC RAISE TO $15/HR. 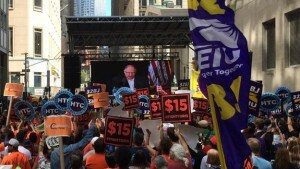 Fast food workers rally in New York City; they have just won their demand throughout the state. 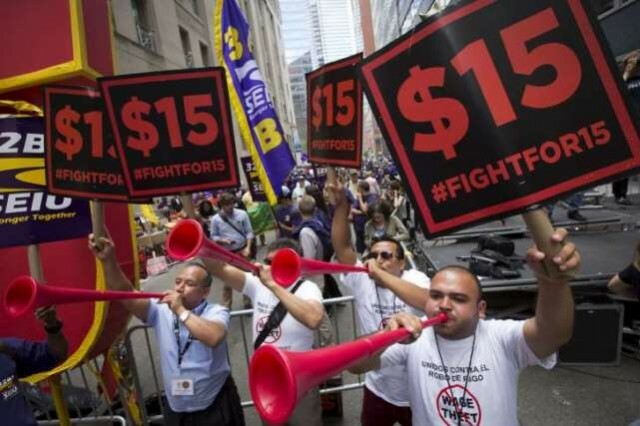 ALBANY, NY — New York made shockwaves on Wednesday when a specially-convened state wage board called for a hike in the minimum pay for fast food workers to $15 an hour. Assuming it’s approved by Gov. Andrew Cuomo –and no signs suggest otherwise– the new rate will be, at once, a jaw-dropping victory for labor activists, a rare political setback for name-brand restaurant chains, and the latest piece of fodder for a national debate about the value of fair pay. It also can’t come soon enough for David Ramirez. On most days, Ramirez wakes well before dawn in downtown Brooklyn, where he splits monthly rent of $1300 with his mother who receives Social Security benefits. He usually starts work at 5 in the morning. 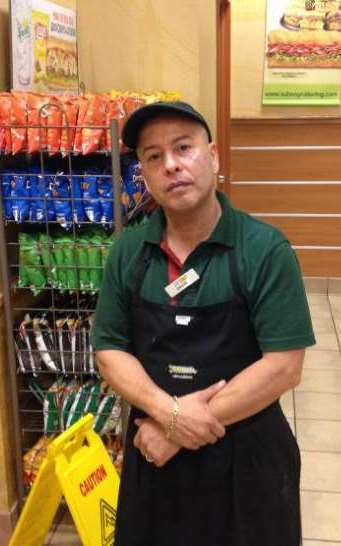 When his shift ends at 3 in the afternoon, he heads to a different Subway in Woodmere, Queens –about an hour and a half away by train– and works another 4 hours. It makes for an exhausting 60 hour work week. Since he divides the time over two jobs, neither tallying more than 40 hours per week, Ramirez doesn’t earn any overtime. In New York City, he says, those annual earnings of about $21,000 are hard to get by on. A raise of $6 would go a long way. 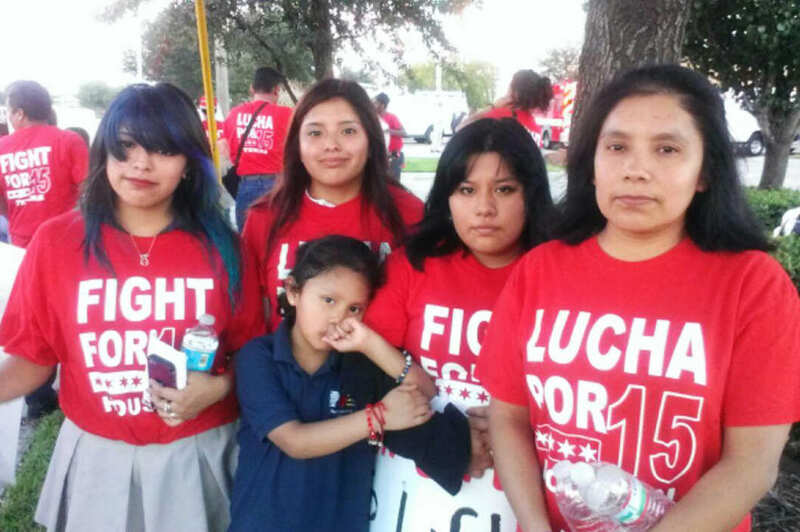 Video below: Fast food workers of Minneapolis, MN rally June 6, 2015 before traveling to Detroit for national fast food workers convention. It was the same day New York Governor Andrew Cuomo held the first public hearing on wage hike in that state. Workers at this rally fully expected NY victory. That was also the thinking of the Fast Food Wage Board, which voted unanimously in support of the $15 rate. The pay hike would apply to fast food chains with 30 or more locations nationwide, and be phased in over time, becoming mandatory in New York City by 2019, and the rest of the state by July 2021. Backed with enthusiasm by Gov. Cuomo, the raise can proceed without legislative approval: a New Deal era law allows state regulators to boost wages for specific industries and occupations where they deem pay “insufficient to provide for the life and health” of workers. The raise comes after two and a half years of high-visibility protests from the so-called Fight For 15, a movement of low-wage workers and labor activists backed by the powerful Service Employees International Union that demands higher wages in fast food and other low-paying sectors. Crowds cheer as New York board approves $15 hr. minimum wage for fast food workers. Amid pressure from these activists, other major cities have already approved $15 minimum wages –Seattle, San Francisco and both the city and county of Los Angeles– but New York’s looming pay hike is unique for a couple of reasons. For one, it’s the only one to apply to a single industry. It also would take effect across the entire state, whereas the other ambitious wage hikes have all been limited to cities. 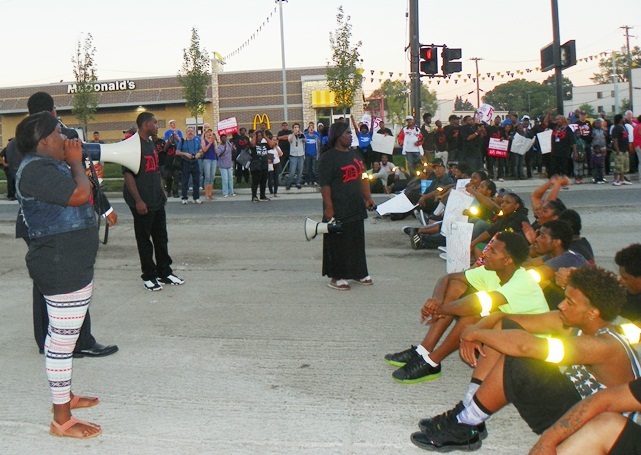 Detroit fast food workers block east side intersection at McDonald’s Sept. 4, 2014 during national day of civil disobedience. James Sherk, labor policy expert at the conservative Heritage Foundation, says the pay mandates will accelerate the industry’s turn toward automation — self-service tablets, for example, that replace the need for cashiers. Such technologies are already being developed, but are not yet widely used. Police start arrests at fast food protest in Detroit Sept. 4, 2014. Tsedeye Gebreselassie, staff attorney at the left-leaning National Employment Law Project, shrugs off the criticism. Businesses always tend to complain when the wage floor rises, she says, and this is no exception. Plus, the hike is staggered over time, giving the firms –which include some of the largest corporations in the nation– plenty of time to adjust. 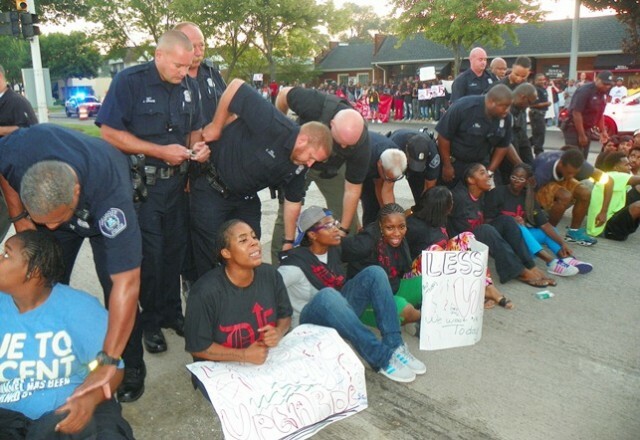 Detroit fast food workers took over W. Grand Blvd. in front of McDonald’s during first fast food workers strike in 2013. It’s also about setting high standards for an increasingly large part of the labor force, she says. More than 4 million people work in the fast food sector nationwide; 180,000 of them are in New York. As the recovery continues to inch forward, lingering myths of fast food as a temporary gig for teens simply don’t reflect the new economic reality. A New York survey found 87.5 percent of the state’s fast food workers are aged 19 and older. “Because this is such a growing industry, more and more adults are going to be spending their careers in it,” she says. It makes sense that decent pay should follow. Another benefit of the wage hike is that it remains largely immune to a common threat of employers confronted with mounting high labor costs: relocation. Unlike the sorts of manufacturing jobs that companies can easily ship to cheaper states or countries — say, General Electric’s ongoing relocation from a unionized capacitor plant in Fort Edward, New York to non-union Clearwater, Florida — fast food restaurants aren’t about to up and leave the state en masse. “You need to be where your customers are, where the demand is,” says Gebreselassie. First fast food workers’ strike in Detroit 2013. For many workers, business concerns don’t change the fact that current pay practices verge on the nightmarish. Jose Carillo. 81-year-old NYC McDonald’s worker, is arrested during national fast food strike in 2013. Physically, he cannot tolerate much more. Carrillo says he usually works 15 to 16 hour days, or 75 hours a week. A $15 wage would be a relief, he says, before going to fix coffee for an anxious customer in line. Meanwhile, for David Ramirez, a pay raise might resolve his MetroCard dilemma. Right now, he uses a weekly pass. He knows it’s cheaper to get the monthly one, but it’s especially prone to malfunction if it bends a lot — it’s happened before and takes far too long to get fixed. The monthly cost difference between the two passes is about 7 dollars. He would rather not make such calculations. 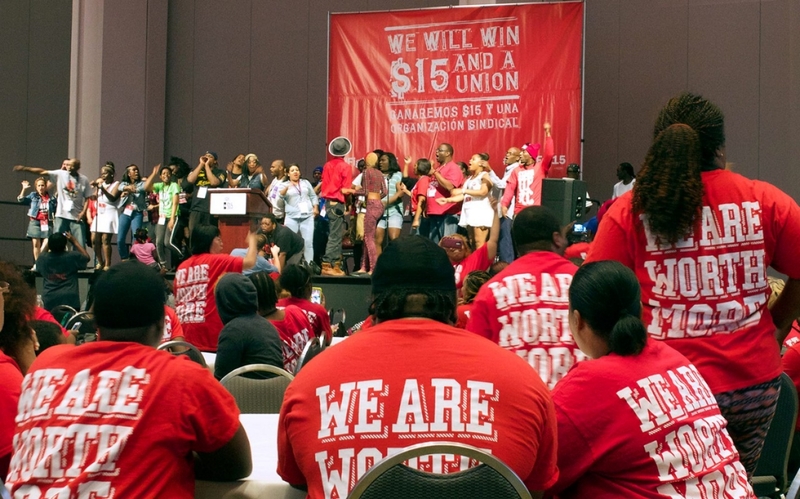 Fast food workers at national convention in Detroit June, 2015. 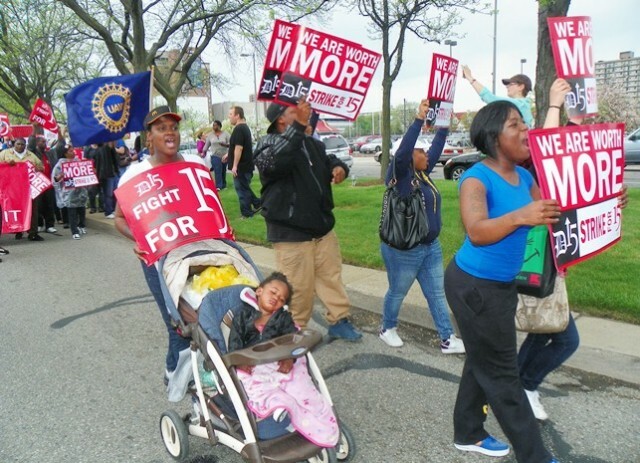 DETROIT — Some 1,300 low-wage fast-food workers came from around the country to Detroit’s Cobo Center on Saturday for the second “Fight for $15″ convention. There was a victorious buzz in the air, though most of the line cooks and cashiers are new to the labor movement. In the main hall, a sea of workers and allies stomped in unison and yelled, “We work, we sweat, put $15 on our check!” The round ballroom was festooned with banners from Arizona, Little Rock, St. Louis, Memphis, Boston and Miami. 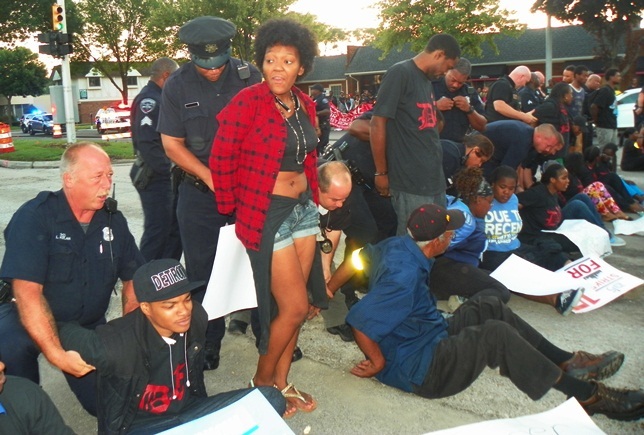 Arrests in Detroit Sept. 4, 2014. 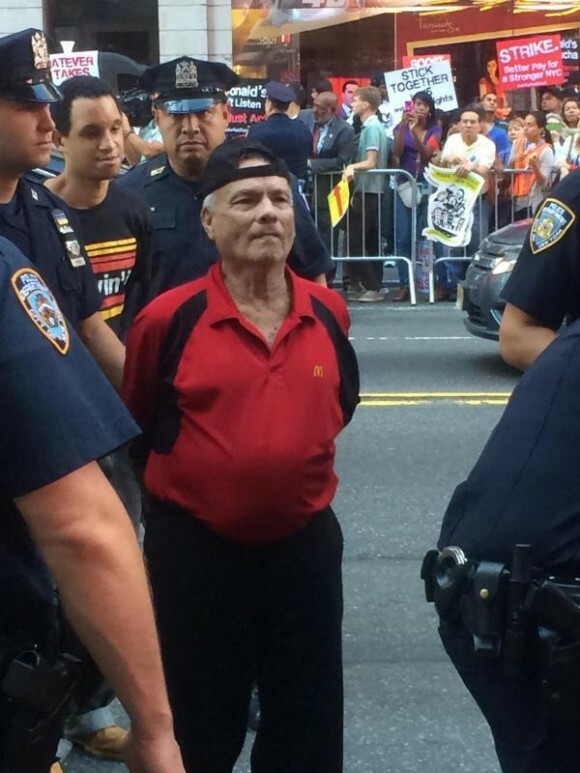 Those wearing the red “We Are Worth More” T-shirts were mostly Latino and African American, organized by community groups and the Service Employees International Union, and drawn from almost every imaginable franchise — McDonald’s, Dunkin’ Donuts, Wendy’s, Subway, Arby’s and regional chains like Hardee’s. The workers still want what they demanded in the first fast-food strikes in 2012: $15 per hour and a union. Fifteen dollars seemed unattainable then, but much has changed. 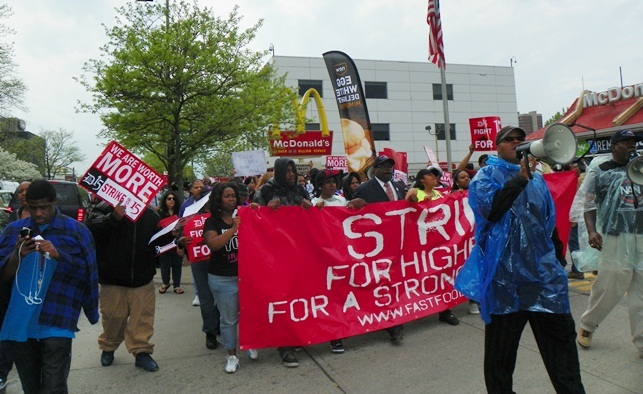 On Friday, New York state convened its wage board to consider raising minimum hourly pay for fast-food workers, and St. Louis was set to introduce a proposal for phasing in $15 across the board. Last week, Los Angeles passed a $15 minimum wage to take effect by 2020, following the lead of San Francisco, Seattle and Sea-Tac, Washington. “Two years ago, wage inequality was not even being mentioned. 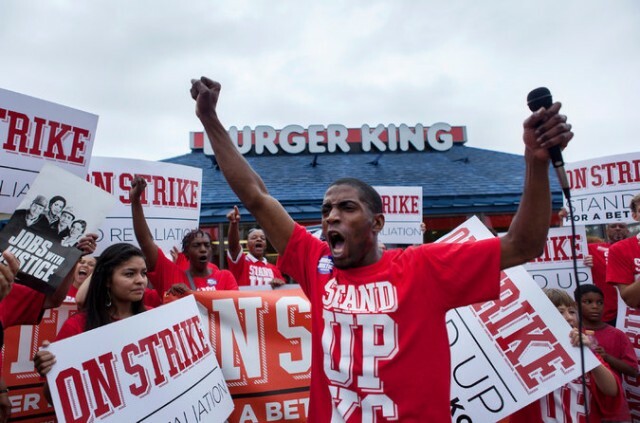 Now, there’s talk of how all workers need benefits and a raise, and the benefits of joining a union,” said Terrance Wise, an employee of McDonald’s and Burger King locations in Kansas City and an oft-profiled member of the Fight For $15’s national leadership committee. He has helped coordinate seven strikes in Kansas City and came by bus to downtown Detroit with 150 fellow workers. Janell Rose and her husband Gaylord Cade also came from Missouri. They are both employed in the industry — Rose at Hardee’s and Cade at Wendy’s — at $7.65 per hour, supporting themselves and their three young children. Cade has grease burns on his forearms. Luis Ortiz’ family in Texas has four fast food workers. A full-time employee paid the federal minimum wage of $7.25 lives just above the federal poverty level, which is itself an outdated measure of wellness. According to a 2013 study by the UC Berkeley Labor Center, more than half of the households supported by front-line fast-food workers rely on public benefits, including Medicaid and food stamps. This, many economists say, is a subsidy to corporations like McDonald’s, which reported nearly $5 billion in profits last year and has been condemned for pushing employees to apply for government assistance. Walmart, too, is vulnerable to the same criticisms, and worker protests under the banner of OUR Walmart actually preceded those in fast food. Yet it is the calls for justice at McDonald’s, Kentucky Fried Chicken, Burger King and Taco Bell — those iconic, omnipresent U.S. eateries — that have catalyzed discontent over wages. This entry was posted in Uncategorized and tagged D15, FIGHTFOR15, LuchaPor15, StandupKC. Bookmark the permalink.